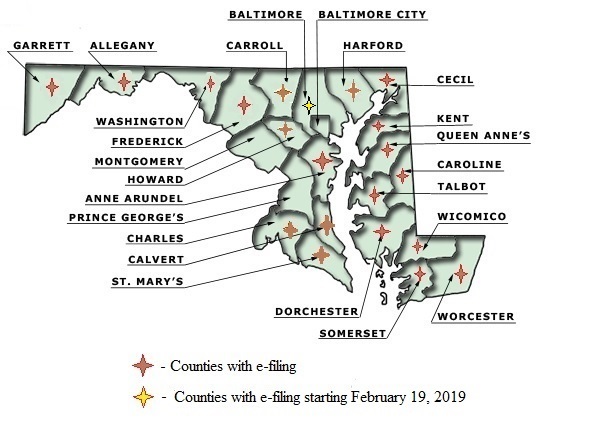 Maryland’s e-filing system, MDEC, is coming to Baltimore County on February 19, 2019. It joins Allegany, Anne Arundel, Calvert, Caroline, Carrol, Cecil, Charles, Dorchester, Frederick, Garrett, Harford, Kent, Queen Anne’s, Somerset, St. Mary’s, Talbot, Washington, Wicomico and Worcester counties, which have already successfully implemented MDEC. E-filing opens sophisticated, user-friendly opportunities enabling firms to leverage the technology associated with e-Briefs. Only Baltimore City, Prince George’s County and Montgomery County remain to be integrated into the MDEC system. Counsel Press’s clients will continue to enjoy a smooth transition for their appellate filings, as we always take care of the procedural aspects. E-filing allows enhanced capabilities for your electronic briefs and record extracts. Hyperlinks, bookmarks, text-searchable cites and other navigation features will make a positive impact on all users. If you haven’t already done so, make sure to register with MDEC to receive your user name and password for their system. You can learn more about registering for MDEC here: http://www.courts.state.md.us/mdec/efiling.htm. For more information on e-Brief services or appeals in Maryland in general, please contact Counsel Press at 202-783-7288.